Sign up for the NALMS conference in Spokane now! An invasive species of aquatic snail has been found in a Seattle-area stream that flows into Lake Washington. 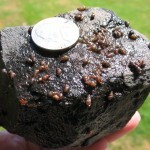 As part of their regular monitoring in 2009, USGS scientists sampled a site on Seattle’s Thornton Creek; recent analysis of the sample came back positive for New Zealand mudsnails (Potamopyrgus antipodarum). Additional sampling in May 2011 confirmed the presence of these invasive snails at the mouth of Thornton Creek. 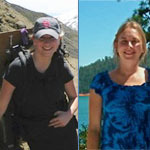 Congratulations to Chelsie Strowbridge (left) and Ellen Preece (right), who have been awarded WALPA Scholarships to advance their ongoing lake research. Read on to learn more about these up-and-coming researchers and their work to protect lakes. And make sure to attend the NALMS conference in Spokane (see above), especially the WALPA business meeting at noon on Friday, October 28th, where you can applaud Chelsie and Ellen as they receive their award certificates. Sign up for NALMS conference in Spokane!